I love this game and I want to see it succeed, as I'm sure all the fans do. I'm curious about the different ways to market Hex. I heard Corey Jones talking about this in a recent Q & A and it really peaked my interest. Just like Corey said, I find it strange that there are still a lot of people who don't know about Hex. But when they find out they think this game is pretty awesome. The great thing about this game is that the community really cares about the future of Hex. So how do we add even more fuel to the hype train? I would love to get feedback from the community and the Hex team. Any feedback or comments? Please let me know. I'm feeling HEXy, are you? You're basically doing the best thing any individual can: letting your friends know about it. Additionally, reading the forums, listing that you're playing it on services like discord/steam/etc., watching streams of it, or streaming it yourself all help... as those increase exposure. If you have access to other medium, such as a website/etc. or if you know anyone who does you can suggest they do a piece about it or write one yourself... but that's not something everyone can do. Thanks for the constructive feedback. Those sound like really good ideas. I'll have to give it some thought. Writing an article myself could be very interesting. I don't have a website but maybe I could create a blog or something like that. I do the whole streaming thing and, like you said, I'm sure that helps. Great discussion so far! My two cents, and this is based on personal experience; marketing is only effective if you reach your intended audience. I believe that intended audience is people who already play (digital) CTCG games but are bored with what they know or are looking to expand. Basically: we need to steal all the MTGO players and bring them to the dark side. It's what happened to me; i was YouTubing some MtG last year and stumbled upon Chris Van Meter's introduction to HEX. I gave it a try because it was late and I was bored thinking it would probably be some sort of Heartstone, which I've tried but didn't like. One hour later I was very excited. My excitement came because there was a strong multitude of positives about the game that immediately stood out. I could have ignored the game if only one or two of those were present but this large number was too compelling. 1. Artwork looked great. It looked like Magic artwork, not like cheese from all these other games. It is both stunning and mature. Funny too. 2. Large free to play section. Start playing the game with zero financial investment. Don't like it? Throw it away and lose not a second of sleep over lost bucks. 3. Tier 1 decks that can win you actual decent prices cost a fraction of Magic decks. Only a few cards are reasonably expensive. If you're not a collector you can easily play this game to the fullest without having to forfeit groceries every other week. 4. HEX is magic plus. Chris' introduction got me really excited about the digital-only mechanics like tunneling and prophecy. 5. Aside from the extra stuff HEX is very much like magic. If you enjoy playing the game system of MtG it's almost impossible not to enjoy HEX. 6. This game has all you want in a digital CTCG and it has a fully working client to boot. That other game does not, it simply doesn't. Sure the HEX client has bugs, things to smoothen out and room for improvement. But playing the actual game? Works, like a breeze. 7. (This one was introduced after I started playing but needs to be mentioned) the account leveling system. You get free stuff, even if you play for free, and a good chunk of that free stuff is actually very good stuff; entry tickets, AA's that are actually constructed playable and assorted fun goodies. I like that a lot. 8. The entire team behind HEX is part of the community. You can talk to them, they actually read feedback and they give a strong impression that they care about your experience. This is really important, even if they don't always fix or build what you want them to. All of the above is stuff that most non-HEX CTCG-players do not have, at least not all of it. I know we can't just go and spam MtG-related fora and networks but if you do manage to gain some ears over there, i think they should hear about all of the above. Exactly this. Hit the target audience. I don't know how successful their "featured streams" they paid for last were but I would bet the results were not that good. While there might be some Herthstone players out there looking for something deeper AND willing to pay for it, generally people in HS streams are not like that. The fact that the people that did the streams dropped Hex like a hot potato doesn't look good either. I don't know how viable it is but my suggestion would be to have a couple of people outside/very close to a big MTG grand prix. Have them handing out codes for sleeves or mercs, maybe a few random draft codes. This in my opinion would be a good idea because people that go to these events have no problem dropping cash on playing cards. I do think giving away draft/evo codes at 'certain events' might be feasible. That's a very generous and detailed post. Thanks so much for the juicy feedback! I like the Evo idea to. Yeah, giving away codes for an evo sealed on gaming-related events\websites\etc is a good idea, I believe. I've started my YouTube channel some time ago. I made a big review of HEX, also there I have tournament recordings, a deck review and patch/update reviews. All the content is in russian. People ask lots of questions, after HS and even some more complex card games HEX is a huge leap for them. And I try to make their transition to the new game smooth and painless. BTW, feel free to subscribe to the channel. Even though the content is in russian, some recordings, like tournament plays and deck reviews are language independent. Also, it would be your assist to spread a word about HEX and its awesomeness. Let's hope one day HEX becomes a number one digital card game in the world. I agree, hopefully the game grows! While watching some MTGO streams on Twitch, i have asked people for their experience with Hex. -some have said they played hex but then returned to mtgo because "why play a copy when you can play the original?" It's hard to have someone that is invested in a game and likes it to change. So even if someone gets my attention I won't switch because I'm too invested or I like my game. Magic players are like that. There is no f2p players on MTGO andost people love the game (just hate the software). It's very difficult to just nail 1 way to capture new audience and to add to the problem there had been a ton of CCG coming out and people think that 1$ 5 card packs with no value is better than 2$ 17 cards with value. It's hard to convert people. The best example would be Jeff Hoogland. He is a very reputable magic player (1st place scg last year) and he has a ton of magic followers. He also knows a ton of other magic players. He did get some people to try hex but alot of. Time I'll see post under his tweets saying. '' ah I have to try this game you always talking about it '' but I don't see them follow too much on it. Maybe those less invested did the switch but as pros I don't think so. Anyway a long post for saying that there is not just one way of doing it. And just doing publicity about it might not be the only way. Having tournaments that pay cash (hello there 1k clash) and having people talk about it on general is the best Thst can be done. The post was edited 1 time, last by Portensio ( Mar 7th 2017, 4:36am ). This is exactly why trying to target existing TCG players is likely an endeavor doomed to fail. People who are invested in a product tend to be comfortable where they are. They've invested time, money, thought, and emotion there and even if they're not ENTIRELY happy where they are, they're comfortable. The best example I can give you is WoW. There have always been people discontent with certain things in WoW. Yet every time another MMO has come out - even one that was arguably better than WoW - it has failed. Inevitably when it comes out, people stop playing WoW for a week or two, give it a try, but just as inevitably they return. Why? Because going to the other game is kind of like going to a hotel... it's fun for a bit, but eventually you start to miss the comfortable place you're used to - your home. A game you've invested a lot of time and emotion into eventually starts to feel a lot like a home(I know WoW did for me for several years... and even Hex is starting to feel a bit that way now). ESPECIALLY if that game has a social component like a TCG or an MMO. You simply can't win against that. They're not going to leave for something similar to their home but not quite the same, even if it's slightly better... because it's close enough to home but not quite so it just won't feel quite right. Hex needs to find it's own niche, something that will draw a lot of players in. I think they're doing a good job of that with things like PvE and Evo, while still maintaining the things that keep people playing with all of the various tournament events they've got on the cooker. But they're not going to win massive crowds from MTG. It's just not going to happen. Slow and steady growth is what we need, just like Portensio said. I feel like the #1 reason people don't stick with the game and even give it negative reviews is the lack of F2P elements in the PvP side of the game. This is basically Hex's curse as a TCG as it can't give out free valuable stuff at the pace that other games can. The PvE and gold sinks, the free PvP ladder, account leveling and other free tournaments certainly show HxE is doing as much as it can without impacting the economy but many new players to the genre who only got started with cards games like Hearthstone don't really care about the reasons. I wonder if they could have a free phantom sealed once per week during the week when nothing much is going on (with non-economy impacting rewards) and maybe also one for PvP scheduled tournament where players can temporarily have 4 of any card if that doesn't require too much implementation resources. This will allow those players to get a taste of these formats and perhaps confidence/motivation to try the real thing after improving -> experiencing success (and finally join the weekend's Hex Clash prize tourney and be 'converted'). Having a lot of activity during a normally quiet weekday could have nice spillover effects too without killing much revenue. Brand it as something like Wednesday Night Hex so people make it a habit. MTGO isn't free to play. Not only the cards, even the client cost money. Do we really think any other TCG is even worth mentioning as a competitor? I don't think things like Heartstone and the likes are keeping players away from HEX. MTGO is getting by on its paper reputation/history/fanbase, and even it is seeming to take ideas from HS with its foray into "Digital Next". And besides my comment was based on reading a ton of comments on various subreddits, gaming sites, steam reviews, and forums over the past few years relating to Hex. People have come to expect a certain level of 'free' and giving them one free weekly phantom sealed event to taste the waters without spending money doesn't seem too big of a compromise. The game is certainly good enough on its own merits and capable of producing loyal fans should they give the game the time/consideration it deserves, so my suggestion was to tackle that specific problem I see where people try the game out, feel it's actually pretty good and a game they could potentially sink their teeth into, but then figure out they have to do 'x' FRA runs to enjoy just ONE limited event, and then get frustrated at the prospect and /gquit. Another way to explain it: what do we tell new players to do when they join the game? First step is try out PvE and see if you like it. The second step if you don't want to grind PvE for ages is to sink money and do some limited event. They naturally get crushed and feel like this is a money grab game. There needs to be a step before they go into sinking money in limited and this weekly free tournament could be a good place for them to build skills and work up to the confidence in spending money on a real event. I do understand your point and if feasible more free stuff is of course good, i'm just surprised that the lack of phantom events or other free stuff might be what people keep from playing the game. Granted, I haven't read all those reviews you mention. 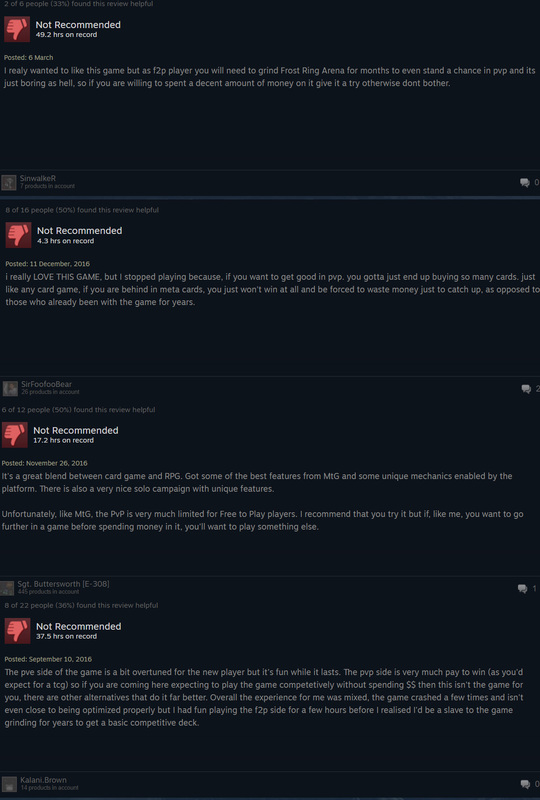 Some reviews below I'm referring to. What you'll notice is these people actually quite like the game but it's the business model turning them off. I'm not sure if what I suggested would be enough to make them stick around tbh, but there might be other ways to accommodate them while not deeply impacting the economy. Hex is in a unique position in this regard (MTGO I would consider the exception, not the rule) so it'll require some new & fresh ideas/approaches to make a TCG more attractive to F2P leaning CCG fans. And I do think that HS has created enough new fans of the genre that this would be an avenue worth pursuing - making the ladder similar to HS one suggests HxE feel the same way. I understand that HxE are scared of offering free versions of their paid modes as it could set a bad precedent and kill some of their actual revenue, but I'm suggesting it in a very limited capacity with rewards that are only as good as the equivalent of spending a few hours in PvE. The hope would be that these players play in a few of these tourneys, eventually get to a place where they have some good results, and take the plunge into a Hex Clash for example. Then at that point if they're hooked into playing Hex Clash every week that'll be a huge boost for the game. If this model works for limited you can do the same for constructed - have a constructed version of Hex Clash on Sundays and a free phantom constructed on a weekday to, in similar fashion, ease them in to the weekly tourney. I have my doubts if making people stick around is something that works. If you don't want to spend money on HEX you won't be winning any tournaments. So, the question is whether phantom tournaments will change the minds of people who don't want to spend money. Will they want to spend money after having been able to sample competitive play for free? I'm not sure how significant the number of people would be that stick, but that's speculation. MTGO players on the other hand do spend money on a digital TCG. The only things that needs to be changed in their mind is for them to spend it on HEX instead of on MTGO. That seems like the easier path to take, in my opinion. Especially since HEX is much cheaper to play than Magic. Both roads could be pursued though, of course, they're not mutually exclusive.